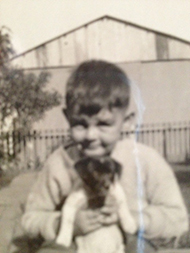 Much like my brother and his first rescue dog inspired the story of Pet-Friendly Francie. My parents’ love-story inspired the book’s setting. 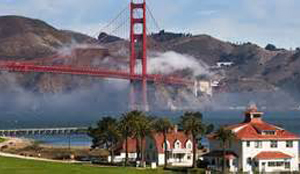 My father grew up on the Presidio and Fort Winfield Scott in San Francisco, and along with his big brother played on Crissy Field. They also lived in a house where the current Golden Gate Bridge tollbooth is now located! That’s right. The Golden Gate Bridge hadn’t been built yet. 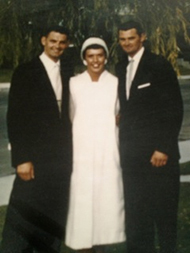 My father and my uncle watched the bridge being built as they played on the military bases overlooking the bay. Meanwhile, my mother grew up on a farm in Oregon, and made her own animal care clinic – before veterinarians became popular. She even rescued a fawn, and raised it as her own. As a young lady, she moved to San Francisco and fell in love with the city. Then she fell in love with my father. It was “meant to be” as they say, for her grandfather’s name was… Winfield Scott! So, while I didn’t grow up in San Francisco, you can see why it holds a special place in my heart. 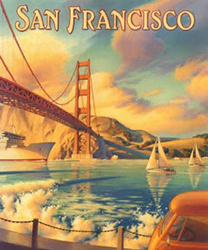 If you’re lucky enough to be planning a trip to San Francisco, check out this informative travel guide “50 Best Travel Tips from 10 Years of Travel” packed with practical tips and advice, courtesy of Jane Rogers of Your RV Lifestyle. She includes sustainable and eco travel suggestions as well. San Francisco, which was named after Saint Francis of Assisi- the patron saint of animals – has many non-profit organizations helping wildlife, animal life, human life and the environment. No wonder it’s the most pet friendly city in America! Another couple fun facts. The Palace of Fine Arts was built for the 1915 World’s Fair. 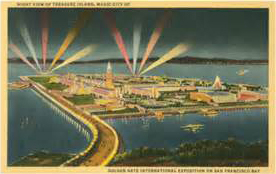 And Treasure Island was built for the 1939 World’s Fair. 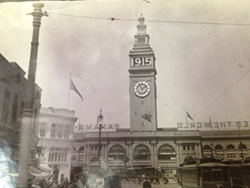 We dug up an old photo from my great grandfather of the Ferry Building in 1915 (Look closely at the Ferry building’s clock tower at the top of this page) That was only nine years after the big earthquake and fire of 1906 almost destroyed the whole city! My fido-friendly pop and his pup. I hope you enjoy taking a dog-friendly tour of San Francisco in Pet-Friendly Francie with Francie, Coach Waggit, and Scrimmy!